'Greenview' is a two bedroom stone character cottage, overlooking the village green in the desirable village of Thornborough. 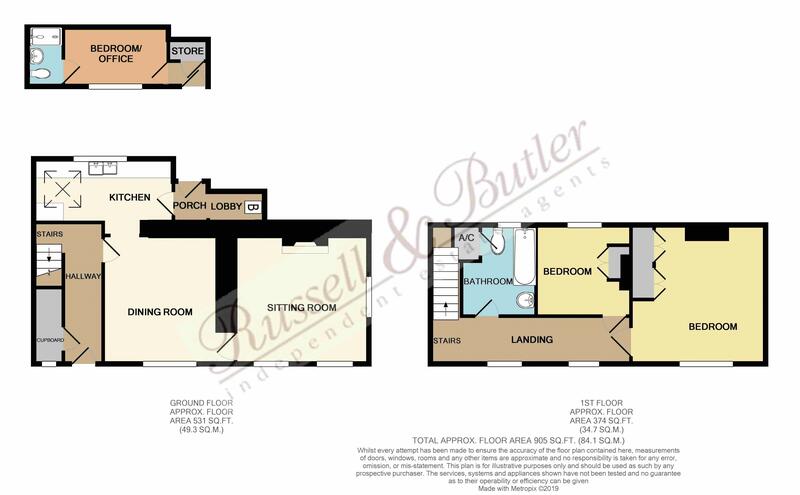 The property is in need of refurbishment and is offered for sale with no onward chain. Accommodation comprises: Entrance hall, two reception rooms, kitchen, two first floor bedrooms and bathroom. There is a separate annex/outbuilding to the rear and pretty enclosed gardens to the front aspect. EPC rating G. Offers are invited via sealed bids, closing date Monday 29th April. Radiator, under stairs storage cupboard with window. Exposed beams, three wall light points, radiator, window to front aspect, door to sitting room. Exposed brickwork, feature fireplace with wood burning stove, three windows to side and front aspects, exposed beams, four wall light points, television point, radiator. Fitted to comprise inset single drainer stainless steel sink unit with mono bloc mixer tap, cupboard under, further range of wall and base units, quarry tiled flooring, ceramic tiling to splash areas, window to rear aspect. Roof window, shelf recess. Gas fired boiler, space and plumbing for washing machine. Window to front aspect with village views. .
Two wall light points, window to front aspect, radiator, built in double width wardrobes. Radiator, window to rear aspect. Built in storage cupboard. White suite of low level w/c, pedestal wash hand basin, panel bath, ceramic tiling to walls, window to rear aspect, loft access. Airing cupboard housing hot water tank. Detached to the rear of the property with entrance door, shower room, wash basin, w/c, window to side aspect, radiator. Storage Cupboard. Fully enclosed, fruit and willow trees. All mains services connected with the exception of gas. Council tax band E.